Last Friday night Stuart and I went to see a new version of Ibsen's The Lady From The Sea at the Donmar Warehouse in London's glitzy West End. We love Ibsen and we simply loved this production. Elinor Cook has transposed the action from 19th-century Norway to the Caribbean in the 1950s and is directed here with both style and flare by Kwame Kwei-Armah. The play is hauntingly delightful. 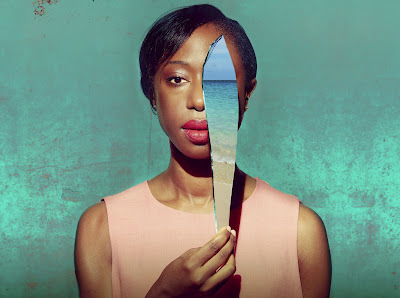 Nikki Amuka-Bird plays mermaid-like Ellida Wangel who is in a dilemma: she is conflicted between her duty to her devoted doctor husband Edvard Wangel (Finbar Lynch) and her attraction to a mysterious, seagoing Stranger (played by Jake Fairbrother) to whom she was once betrothed. She is being driven mad as she is tortured by her dreams. Her only relief seems to come from her endless swimming in the deep black sea to escape the torment. Shifting the story to the Caribbean also does nothing to diminish the stories potency. Ellida, like most of the characters, feels trapped in an island paradise with the sea as the only escape route. Bolette (Helena Wilson) Edvard's elder daughter from a previous marriage wants out too. She wants to go to Oxford to study urged on by her lonely ex-tutor played by Tom McKay who secretly loves her. Hilde (Ellie Bamber) is Edvard's mischievous younger daughter who feels trapped too and who seeks her relief by tempting sickly sculptor (Jonny Holden) to taking her out. It's a fabulous setup of these three tormented women with genuinely heart-wrenching moments. Go see while you still can.